Patricia A. Edwards, a member of the Reading Hall Fame is a Professor of Language and Literacy in the Department of Teacher Education, and a Senior University Outreach Fellow at Michigan State University. A nationally and internationally recognized expert in parent involvement, home, school, community partnerships, multicultural literacy, early literacy, and family/intergenerational literacy, especially among poor and minority children. 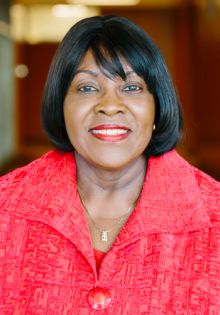 She served as a member of the IRA Board of Directors from 1998–2001, and in 2006-2007 as the first African American President of the Literacy Research Association (formerly the National Reading Conference), and as President of the International Reading Association (2010-2011). She is currently the co-editor of the Michigan Reading Journal. She is the co-author of A Path to Follow: Learning to Listen to Parent (1999) with Heather M. Pleasants and Sarah H. Franklin, Bridging Literacy and Equity: The Essential Guide to Social Equity Teaching (2012) with Althier M. Lazar and Gwendolyn T. McMillon, and Change is Gonna Come: Transforming Literacy for African American Students (2010) with Gwendolyn T. McMillon and Jennifer D. Turner. At the 2011 annual meeting of the Literacy Research Association, Edwards and her co-authors were recognized for their book with the prestigious Edward B. Fry Book Award. This national award honors authors of an exceptional literacy research and practice book. Dr. Edwards is the author of Tapping the Potential of Parents: A Strategic Guide to Boosting Student Achievement Through Family Involvement (2009), Children literacy development: Making It Happen Through School, Family, and Community Involvement (2004) and co-editor of Best Practices in ELL Instruction (2010) with Guofang Li. In addition, Dr. Edwards is the author of two forthcoming books: Achieve! Aha Moments, Straight Talk, and Practical Solutions for Helping Students of Color Succeed and New Ways to Engage Parents: Strategies and Tools for Teachers and Leaders, winner of the 2017 Delta Kappa Gamma Educators Book Award. At the 2012 LRA annual meeting, Dr. Edwards received the Albert J. Kingston Service Award. In May at the annual meeting of the International Reading Association, Dr. Edwards received the 2014 IRA Jerry Johns Outstanding Teacher Educator in Reading Award. Dr. Edwards received the 2015 Michigan Reading Association’s Outstanding Teacher Educator Award. She has been invited to serve as an expert consultant for the Fulbright Specialist Program. She has also been invited to join Michigan State University (MSU) Leadership Learning Community: “Tending the Path Forward after Full Professor: Career Paths of Women Professors.” More recently, Dr. Edwards was invited to serve as external reviewer of the Language and Literacy Curriculum at Florida Atlanta University (January 2016) and Central Michigan University (March 2016).